One of the most fun things about having a little girl is splurging on accessories, but keeping all those bits of cuteness organized is a whole other animal. This DIY headband holder made from an oatmeal container is the perfect solution for corralling those adorable stretchy baby girl headbands and big kid headbands alike! Open your oatmeal container and empty the oatmeal into a bowl—set aside for later. Cut your fabric to 17.5″ x 10.5″. Use fusible hem tape to iron a 1/2″ hem on one of the short sides of your fabric. Generously apply the spray adhesive to the wrong side of the fabric (I recommend doing this outside on top of some scrap cardboard as the adhesive is very sticky). Starting with the un-hemmed edge, wrap the sticky side of the fabric around the oatmeal container. Keep the top edge of the fabric aligned directly beneath the plastic rim on the open end of the container. When you reach the hemmed edge of the fabric, hot glue it down. You should have about an inch of extra fabric along the bottom edge of the container. Tuck that up under the bottom rim to create a smooth finish. It may stick due to the spray adhesive. Otherwise you can use hot glue to secure it. 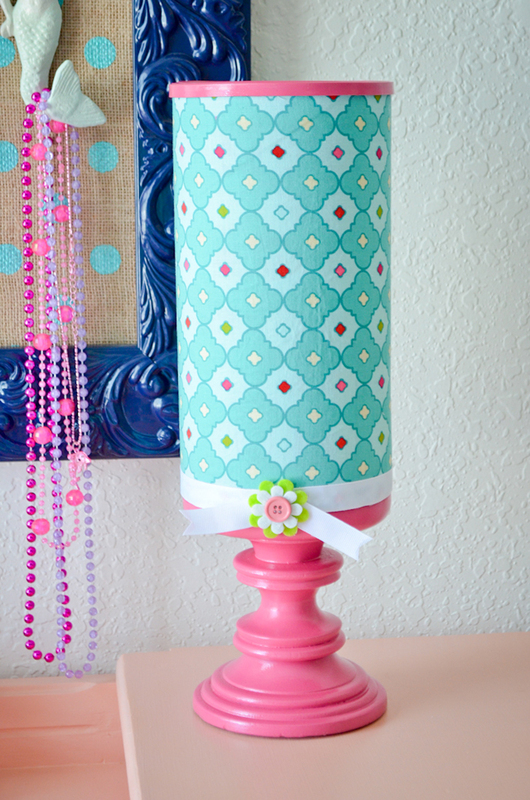 Spray paint the oatmeal lid with a color that coordinates with your fabric. If the pillar candle holder you bought doesn’t match, paint that as well. Once dry, coat both pieces with a clear topcoat for protection. Cut out a circle of felt slightly smaller than the bottom of your candle holder and hot glue it to the bottom. This will prevent the headband holder from scratching furniture. Hot glue the pillar candle holder to the bottom of the oatmeal container. To give the headband holder some weight, put about 1/2 of the oatmeal back into the container. Then hot glue the lid to the top to seal it. At this point the holder is complete, but I recommend dressing it up with a bit of ribbon, buttons, felt flowers and paper cut-outs glued to the top to make it extra cute. In addition to making one for my daughter’s room, this headband holder is also my go-to DIY gift for girls’ baby showers birthdays. Thoughtful, handmade and functional—it’s the trifecta of gift-giving! I have looked for months at stores and on line for the correct size. Where did you find yours? Taryn – I’m not sure which part you are referring to as far as “correct size,” but I found the oatmeal container (42 oz) at Walmart and the pillar candle holder at Target. Any pillar candle holder that is 5″ in diameter at the top will fit the oatmeal container perfectly. I think Ikea has several that will work too. Emily – Good idea! I found that adding the oatmeal back in helped with weighting the holder to prevent tipping. But honestly didn’t try it any other way. Let me know if you do and it works out! Instead of gluing the top shut, I opted to use the container as storage space for bows and hair clips. I did find that a bit of weight was needed, so I went to the Dollar Tree and bought glass stones and a piece of felt. I poured the glass stones in the oatmeal container for weight and cut a circle the size of my oatmeal container out of felt to cover them (tracing makes this very easy to get a perfect fit). I then hot glued the felt over the stones. Not only was this a perfect solution for adding weight, but it made the inside of the container accessible for storage without accidentally grabbing glass stones! I also decided to dress up the lid by poking a hole in the middle of the top and securing a cute, small, decorative door knob. Great tip, Ashley! Thanks for sharing! Hi Helen – The diameter of the base of the oatmeal container is 5 inches. I found that the larger sized generic oatmeal containers tend to be the same. Hope that helps! How did you make the mermaid necklace holder in the back? Have you tried cutting white scrapbook paper to fit the inside circle of the lid? If you look at the picture of the top with the flower, that’s what I did with the aqua color… Just glue it down and then cover it with Modge Podge to protect it. Good luck! Hello! Appreciate the tip! Did you glue it down with the modge Podge too and then coat it with that? Also did you just trace the top of the lid for the circle? Yours looks so fantastic i want to make sure I do it correctly! Thanks again! Hi Jessie, Yes. I traced the lid on the blue paper and then carefully cut away a little around the edges for it to fit inside the top. Glue the paper circle down with modge podge underneath. Let it dry completely (like 24 hrs) before coating it again on top with more modge podge – otherwise it will bubble. Then modge podge any additional paper cutouts (the floral shape) on top of that. I used hot glue to attach the final felt flower and button. So you remember the name of the color spray paint you used? I have been looking for that exact color and am having a hard time finding it! I want to paint my daughter’s toddler bed using that color! Alena – The color is Gloss Berry Pink by Rustoleum. Found it at Home Depot. This is so cute! Do you know what fabric you used? I love it! will this size oatmeal container hold regular size headbands? not just infant headbands? Yes! It holds both child and adult sized headbands. Hi there! THIS IS DARLING!! Where did you purchase the candle holder? I’m having trouble finding one that is 5 inches wide! I’ve been having some trouble finding a candle holder that will fit. Is the candle holder you have 5″ in diameter? Where did you find it? I’ve had no luck finding a candle holder that wide! I’ve checked Target, Walmart, Michael’s, and even done a search on Amazon. Where did you find yours?